Lemon trees are fruit trees that produce small, oval, yellow citrus fruits. Their scientific name is Citrus limon. The lemons are a type of berry called a hesperidium. They grow in sub-tropical and tropical areas. They were originally from southeast Asia between south China and northeastern India near the Himalaya. They were brought to Europe about the time of the Crusades. 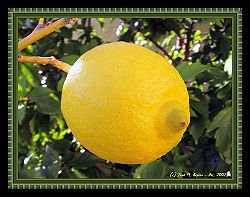 An Italian navigator, Christopher Columbus, brought lemon seeds to America and lemons were well established in Florida. The first commercial lemon orchards were planted in the late 1800's in the United States. 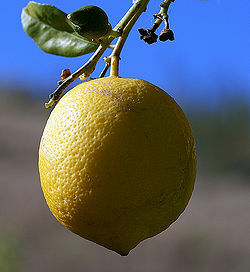 Now the lemons are produced in India, Mexico, Brazil, Iran, Turkey, Egypt, Argentina, Spain, Italy and the United States. The world's three leading lemon-producing countries are Argentina, Spain, and the United States. The lemon is very rich in vitamin C, so it is used in many ways such as food, beauty products and so on. This page was last modified on 7 January 2016, at 18:32.